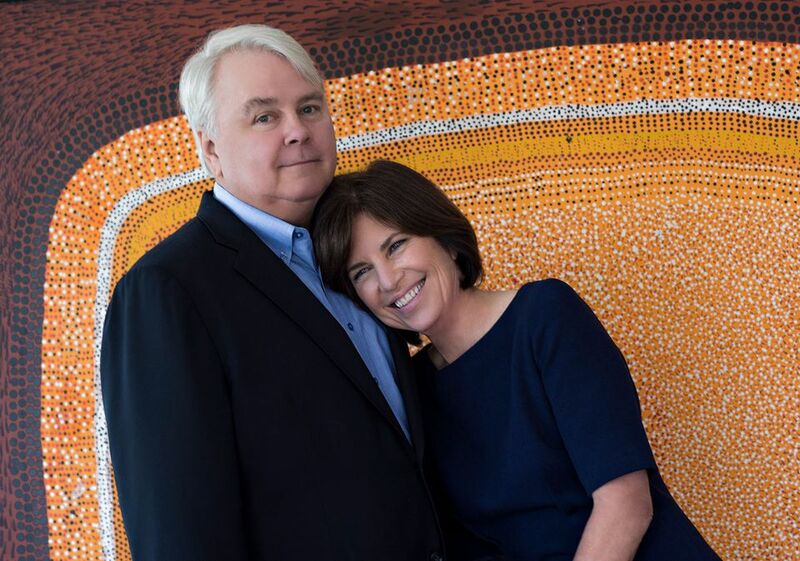 The Miami-based collectors Dennis and Debra Scholl are giving around 200 works of contemporary Aboriginal Australian art from their collection to three US institutions: 90 works each to the Nevada Museum of Art in Reno and the Frost Art Museum FIU in Miami, and 19 works to the Metropolitan Museum of Art in New York. “We’ve been very vocal about wanting this work to be thought of as contemporary art that stands on the same terra firma as Euro-American-centric art,” Dennis Scholl says. He points out that Aboriginal art dates back 40,000 years, but relationships can also be drawn to 20th- and 21st-century abstraction. The donated works—which include pieces by such artists as Warlimpirrnga Tjapaltjari, Gulumbu Yunipingu and Nongirrnga Marawili—give joy on a purely aesthetic level, but also have a deep cosmological meaning, he adds. “We always felt of all the things we’ve ever collected, this might be the most important work,” Scholl says. The couple have collected art for 40 years—in 2013, they gave the Perez Art Museum Miami around 300 works by contemporary artists including Vito Acconci, John Baldessari, Walead Beshty, Ólafur Elíasson, Liam Gillick, Catherine Opie and Raymond Pettibon ahead of the opening of its new home—but only began acquiring contemporary Aboriginal art about 12 years ago, after trips to Australia for their wine-making business. From the get-go, they intended to give the vast majority of what they bought to US institutions. “US collectors are very good at ferreting out pockets of unknown material…We were shocked there was so little of this in the US and so little in US institutions,” Scholl says. They began by buying works on the secondary market, but switched to purchasing works directly from artists and art centres—and commissioning works—so that their money would more directly support the artists and their production. They continue to commission and collect, with the idea that the “vast majority” will to go to institutions, Scholl says. The three institutions for this gift were chosen for their personal significance to the Scholls, or their connections to Aboriginal art. The Frost was the very first museum Dennis Scholl visited, as a 22-years-old undergraduate student at FIU, and by introducing him to art. The Nevada Museum of Art was the first institution to host the 2015-16 travelling exhibition No Boundaries: Aboriginal Australian Contemporary Abstract Painting, drawn from the Scholls’ collection. The Met, meanwhile, has a significant collection of Aboriginal art, but recently started building its contemporary holdings, starting with a 2016 gift from Robert Kaplan and Margaret Levi. Scholl says the museums were able to choose their works based on “what they felt was right for their institutional collections”; the Met, for instance, wanted a “very targeted”, cohesive group of works, and chose 19 pieces, all by female artists. Works from the Scholls’ collection are now travelling around the US and Canada in the exhibition Marking the Infinite: Contemporary Women Artists from Aboriginal Australia, with works by nine female artists, including Lena Yarinkura and Wintjiya Napaltjarri, organised by the Nevada Museum of Art. It is currently at the third of six venues, the Scottsdale Museum of Contemporary Art in Arizona (until 21 January 2018). “The women are leading the way right now in terms of this painting and type of production,” Scholl says.